I've done it! I've finally done it! 255 Challenge Sigils and 358 Mission Crowns! Hooooo...It only took about 9 months and about 70 hours of my life but dangit does it feel good! Anyone else made this special achievement lately? If you have you probably somewhat understand my excitement about it. ...Ultima Weapon is kind of a letdown, though. u done what i dont have the pantience to do! Dang. I felt that way when i 100% completed KH2 in order to get the movie but then I realized I was playing on Easy. Good for you! I definitely don't have the patience for that. Good job but I don't think it was worth it. But it's still cool that you did it all. holy crap, I don't know how you tortured yourself through all those misions, but kudos. That is amazing. Congrats! Though I don't think getting 255 Challenge Sigils was worth it. Whoa. Challenge sigils? Must've taken a lot of work. As a reward for completing completing everything, you have earned a life. You shall be rewarded with the answer to life, the universe, and everything. I only need two more! Maybe you could help me on the ones I need help with. Lol congratulations. I might do this....some day. Great job! That's one tough thing. 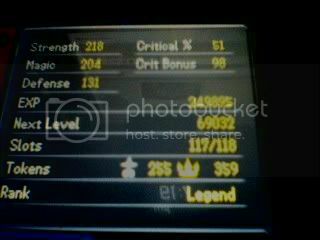 Yeah, ultima weapon's kinda disappointing; rather have +100 damage on every weapon, or just be a keyblade on it's own.